AMYGDALA is a Japanese band, heavily Zeuhl-influenced (much more on the UZ side than Magma, I’d say), with that RIO edge that seems to be the landmark of the greatest Japanese bands of these last few years. Almost all instrumental, the line-up features drums, bass, synths, piano, guitar & occasional other instruments. Dark, pulsating and complex, their music combines powerful rock energy & the insane rythmical patterns of Magma. Recommended to fans of dark sounds : Present, Univers Zero, Thollot, Ruins, Peter Frohmader etc. The brutal apocalyptic menace of the opener “Utrecht” could be described as a four-way collision between Univers Zero (that “chamber” sound), Magma (the rumbling, growling basses), Present (the screaming angular guitars) and Happy Family (the general tone and energy level). Sound like something you might enjoy? The amazing thing is that all this din is made by just two guys! Amygdala is Yoshiyuki Nakajima (keyboards, synths, compo-sitions and programming) and Yoshihiro Yamaji (bass, guitar, and vocals) – and there aren’t much of the latter, this is like 99% instrumental. So what about the drummer? That’s Amygdala’s dark little secret; apparently all drum sounds are programmed, although it’s done so well that on casual listen one might not even notice. This writer listened to the entire disc one time through before looking at the credits in astonishment; similar story with the synth generated clarinet and bassoon voices. The complex metric figures on “Bernoulli’s Organ” give it away, though – few human keyboard players could switch back and forth between these tricky signatures in mid stream without a little help from the ol’ sequencer. The key words here are manic, dark, intense, and foreboding, with no ‘pretty’ stuff to be found anywhere; kind of like the soundtrack to your favorite nightmare. Gotta love it! I was itching to know what, if anything, Amygdala meant and a quick Google search turned up the following: it is a set of subcortical nuclei that is important for perceiving in others and having in oneself emotional or affective behaviors and feelings (e.g. fear, anger). It is, therefore, a component of the limbic system. Now that you know that… Amygdala is also the Japanese duo of Yoshiyuki Nakajima on keyboards, synths and programming and Yoshihiro Yamaji on guitar, bass and vocals. Nakajima composed all the music. And the CD credits aroused my curiosity by noting that Yamaji is in the band Tyrant. I’ve never heard of them but a quick Google search reveals them to be a Black Metal band. 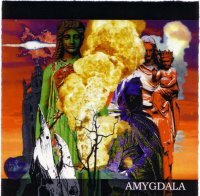 Amygdala isn’t a Black Metal band, but rather play a Zeuhl fueled brand of avant-prog/RIO with blatant references to Magma, Univers Zero and Present. From the first moments of the opening track, “Utrecht”, a thunderous zheul sound crashes over the listener like a tital wave, like Magma as a metal band, before launching into a blazing avant-prog jam. This is very heavy, HIGHLY intense music, with exciting arrangements and instrumentation. “1998″ and “Db” are highlight tracks that get more into Univers Zero/Present territory… very much like Present really. Nakajima’s compositions are impressive, providing the listener with much to digest over repeated listens. And the performances are mercury bursting with power and emotion. “Bernoulli’s Organ” is one of my favorite tracks, being like an instrumental gymnastics exhibition where everyone is lit up on steroids. How the hell do only two musicians perform this music? And what about the drums? There are no drums in the credits, just programming, so if these aren’t real drums then these guys are doing a mighty impressive job with the programming. In summary, Amygdala are by no means doing anything new or different. But if you’re a fan of Zeuhl and RIO school progressive rock you will surely appreciate that what Amygdala do… they do damn good. Heavy rockers into complex prog will drool buckets over this stuff. Solid, diverse, intense, cohesive, inventive and dynamic – just a few of the words you could use to describe this largely instrumental duo whose music, from muscular mellotron and twisted piano playing through immense electric bass and steaming electric guitar, crosses territories as diverse as Ruins, Zappa, Art Zoyd, National Health & Magma, with a set of mid-length (seven to eleven minutes) tracks that take no prisoners, built on intense waves of choppy, intricate rhythms and searing solos from the array of guitars and synths and keys, all the while the drums and bass crunching and pounding down below. There are elements from styles such as the RIO movement, traditional fusion and even touches of prog-rock, but it’s all put into this bubbling, sizzling cauldron to come up with a set of tracks that are truly astounding.